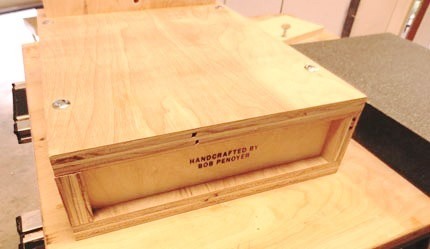 Some woodworkers keep a granite surface plate in their shop. 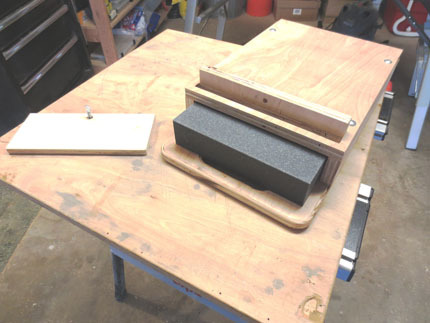 The surface plate is used together with water and fine-grit wet-dry sandpaper to flatten the water stones that they use to sharpen hand tools. Such a precise shop tool needs protection if it is to remain accurate for a lifetime. The box described on this page provides protection on all sides against, nicks, cuts, scratches, and being struck by hard objects. 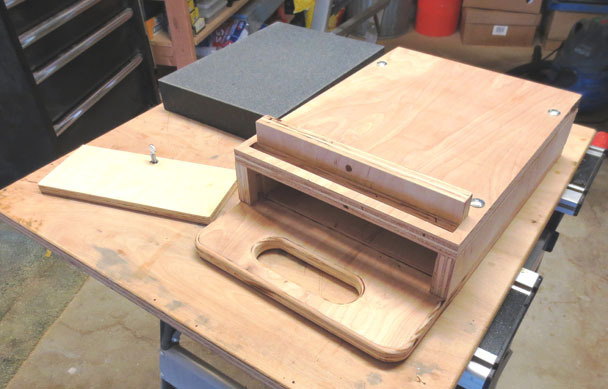 And, because a handhold is included, the box makes handling and transporting the heavy piece of granite much more convenient. 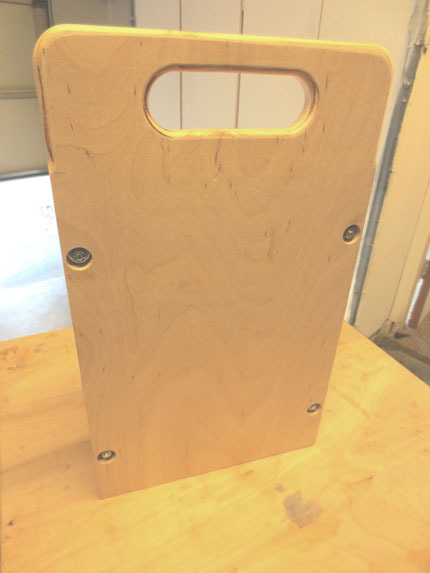 Maybe you can use the ideas and information provided here and in the download file to build your own version of the box. If you think you might want to build it, BE SURE TO READ THE "INSTRUCTIONS.PDF" FILE that's included in the ZIP file. The surface plate is partially in the box. 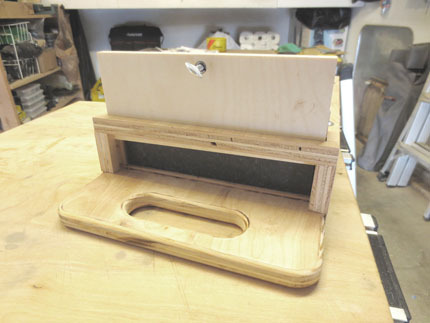 The gate covers the top of the box to prevent the surface plate from falling out. The threaded insert permits the use of the thumbscrew. 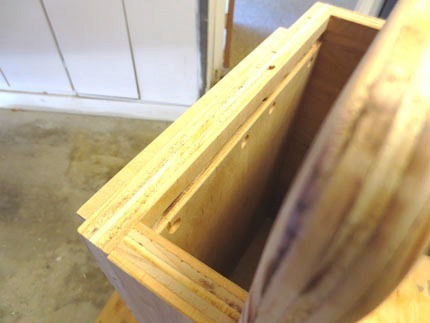 When the gate is inserted into the box, it's captured in the dados of the back and sides plus the slot of the front. 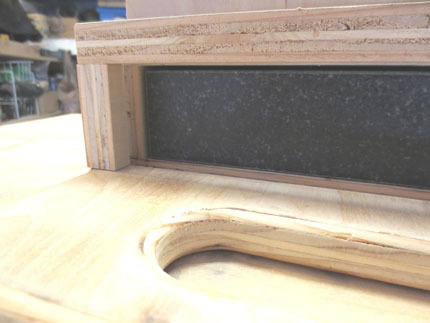 The gate slides into the slot on the front and into the dados in the sides and back. 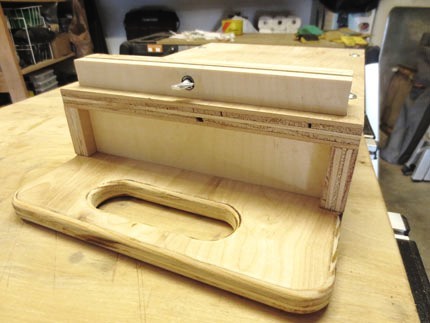 The slot near the top of the front of the box can be seen here. This slot is where the gate slides in. 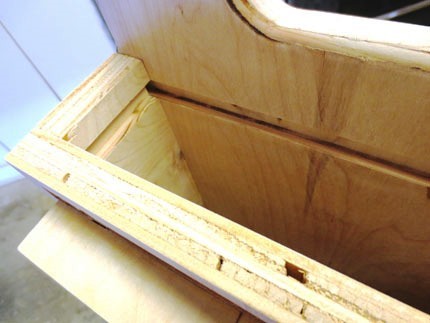 Also visible in the picture are the countersinks for the four screws that pass through the front to secure the shelf. The shelf is located on the front of the box just below the slot. 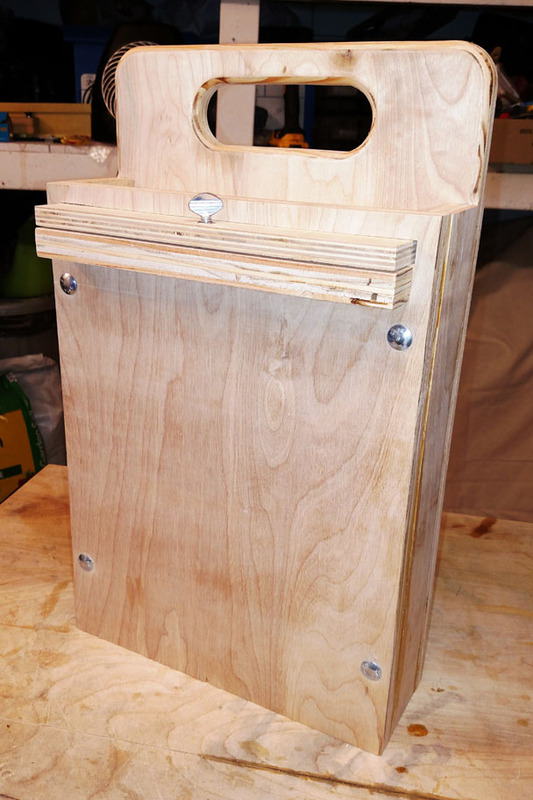 The gate has been positioned through the slot in the front and into the dados in the sides and back. Notice that the thumbscrew is screwed into the threaded insert. 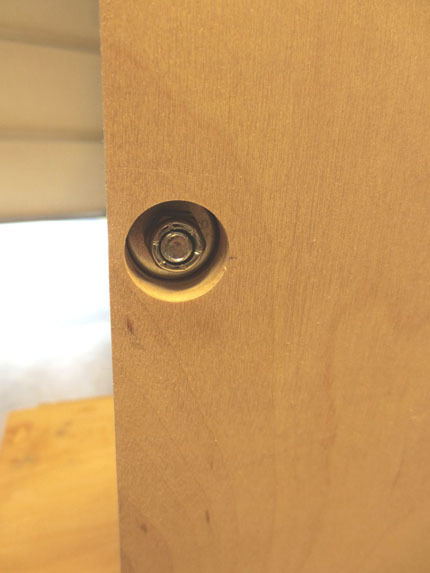 By screwing the thumbscrew in far enough, the end of the thumbscrew passes into the hole in the shelf and prevents the gate from being removed. 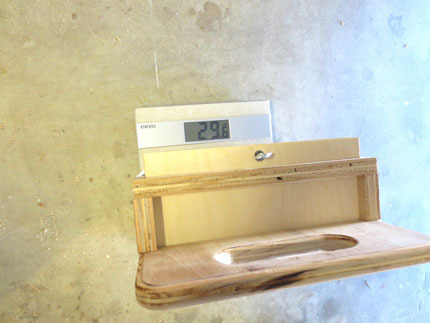 The box with the granite surface plate inside weighs just under 30 pounds. 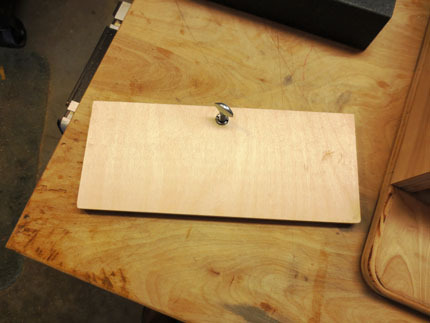 The handhold on the box makes it relatively easy to store, handle, and carry the surface plate. 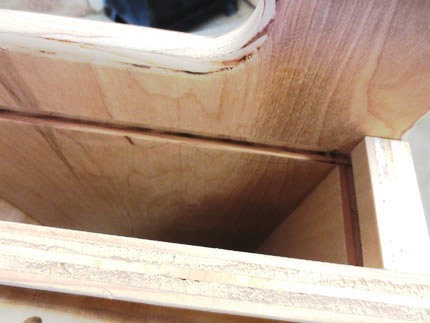 Notice that the edges of the handhold and the top of the box are rounded over for comfort. The areas of the back above the sides is also rounded over.